It’s time to become an indentured servant to our forest dwelling overlords once again in Nintendo’s latest mobile release, Animal Crossing: Pocket Camp. Grab your fishing gear and bug net because these beastly taskmasters are never satisfied! Okay, maybe they are satisfied, but never for more than 2 hours and 59 minutes. 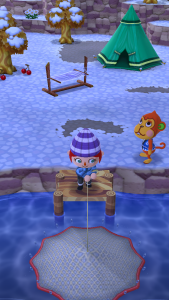 Animal Crossing: Pocket Camp is a lite version of the Animal Crossing games for the mobile platform. The game begins with your character rolling into a barebones campsite in a camper van (which of course you can upgrade, customize, and decorate) to become the new camp manager. Many of our favorite animals are back with their distinctive personality types that translate into themes and essences (natural, cute, sporty, cool, and rustic). The animals rotate in and out of the various areas of the camp every three hours, and of course they have work for you to do. 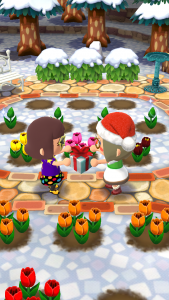 As you perform favors for them–collecting bugs, fish, and fruit–you are rewarded with bells and special gifts like clothing and craft materials. 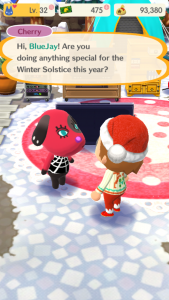 Crafting specific items or furniture pieces such as those from classic Animal Crossing themes and placing them in your campsite will allow you to invite an animal to come visit you. After that, they can stay until you give them the boot and invite a new animal in their place. There are currently 51 animals available at the time of this review. 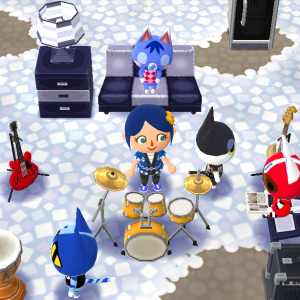 Amenities have replaced the public works projects introduced in Animal Crossing: New Leaf. 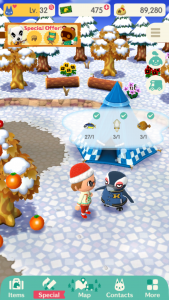 Building and upgrading amenities raises the friendship level cap, so collecting those essences along with bells to pay for the construction is crucial to moving further in the game. As with previous Animal Crossing games, the culmination of endless toil increasing your friendship level with illogical gifts of fish to a clearly herbivorous Angus is his picture. All that work for an animal’s picture. Put that in your camper van and display it. As it stands now, this is a great mobile game with incredible potential for future expansion. It appeals to casual gamers who are new to the Animal Crossing franchise and to those who cannot invest in gaming hardware. It is playable by all ages and the social aspect is particularly well done, allowing you to add friends you know in real life plus giving you the opportunity to befriend players camping out in your area. 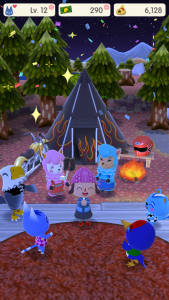 You can visit your friends’ campsite for design ideas and give them kudos. You can also browse their marketplace box to buy that one darned bug you can’t seem to catch on your island before the animal requesting it moves in 20 minutes. 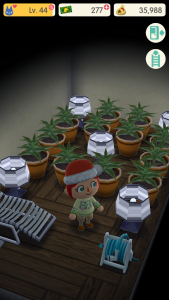 Go snoop inside their camper and find their attic grow farm. Or go visit their garden and water plants for a small reward and cross-pollinate in hopes of getting rare hybrid seeds. Great though it may be, I suspect the game may suffer from short shelf life. Boredom sets in very early with this one. Make no mistake, for Animal Crossing addicts this is a stop-gap measure until a handheld or console version pops up. After that, Pocket Camp can serve as a great companion piece once a new fully-featured game is released. It’s worth noting that I am very concerned that Nintendo may be testing the waters to see if they can move the franchise to mobile and leave it there going forward. Pocket Camp is free-to-start and after one month of playtime, I have zero reasons to spend real-life money here. Micro-transactions are available though. It’s quick to play for a few minutes at a time and it also offers slightly more extended playtime. Zero cost coupled with a low time commitment make this a great mobile game but it isn’t a substitute for the in-depth hours-on-end gameplay of previous titles. 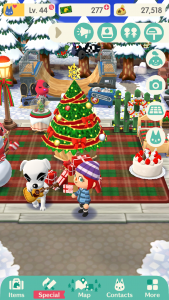 Some days I log in just to get the daily bonus and ignore my animal ingrates. There have been some server issues, mostly during the first week of the game’s release, the Holiday Event rollout, and surrounding the scheduled maintenance during which the Gardening update was released. Apart from the week of release, server connection issues were resolved quickly for me. Nintendo must be making quite an effort to keep the impact minimal so they don’t run off their audience (I’m looking at you, Niantic). It is obvious from the past month that Nintendo will be rolling out new features as the game progresses. Gardening has been added as mentioned and the crafting menu states that clothes crafting is coming soon. 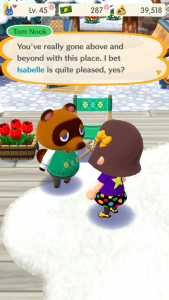 More animals have been added to the camping roster which was great for me as I had already hosted the animals that were previously available and a feeling of boredom was setting in. 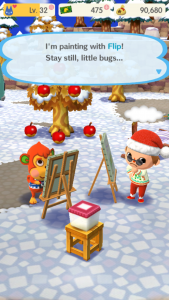 The current iteration of Pocket Camp leaves the collecting component of Animal Crossing very unfulfilled. There just aren’t enough bugs, fish, or seashells to hunt. Fossils are conspicuously missing, though I hold out hope for a future update adding this. There is great potential here–so many things can be integrated like The Roost Café and constellations. For right now the game does fill a niche for times when you don’t want to bring a Switch or 3DS with you or for occasions when you can’t sink a good amount of time into a game, but it leaves diehard fans less than satisfied and wondering how many more Nintendo Directs will leave us crying in our beer before we finally get a proper console or handheld release.